Whether you want to offer your services to support the ongoing programs at Crossroads for Youth or you simply want to attend one of our fundraising events, we welcome your interest in our organization and the positive changes we make in our youth. For those who are interested in volunteering at an event, please review our volunteer page and complete a volunteer application before attending the event. Enjoy a day on the links to help support the ongoing mission of Crossroads for Youth! This year, we will be hosting our golf outing at the Metamora Golf & Country Club. For additional information and to sign up, please visit www.eventbrite.com. The Achievement Center residents perform regular community service at the Baldwin Center. They work at the After School Family Meal Program. 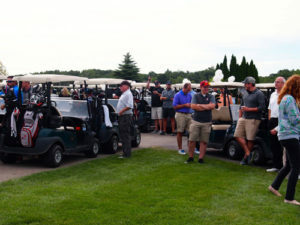 Our 2018 golf outing was a beautiful success with over seventy golfers enjoying a day on the links at the Metamora Golf & Country Club. If you weren’t able to attend, please check back next year for registration and event information.